Review by AllTheBestFights.com: 2018-07-14, pretty good fight between Darren Elkins and Alexander Volkanovski: it gets three stars. Darren Elkins entered this fight with a pro record of 24-5-0 (50% finishing rate) and he is ranked as the No.6 featherweight in the world (currently the #1 in this division is Max Holloway). He lost to Hacran Dias in 2014 but then he has won six consecutive bouts defeating Dennis Bermudez (Elkins vs Bermudez) and Michael Johnson in his last two (Darren Elkins vs Michael Johnson). His opponent, Alexander Volkanovski, has an official mma record of 17-1-0 (76% finishing rate) and he entered as the No.19 in the same weight class. He suffered his only loss when he faced Corey Nelson in 2013, since then he has collected 14 consecutive victories beating Mizuto Hirota, Shane Young and Jeremy Kennedy in his last three. 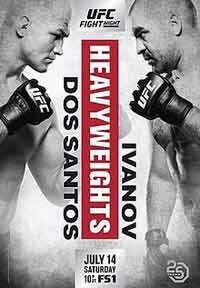 Elkins vs Volkanovski is on the undercard of Junior dos Santos vs Blagoy Ivanov – UFC Fight Night 133. Watch the video and rate this fight!